The ZenFoneMaxPro has proven time and again that it is the #BatteryKing with its 5000mAH Battery capacity. Thousands of satisfied ZenFans have been experiencing longer game time with their phone and for non-gamers longer usage time. You do not have to worry about your Battery running down to 30% it will still last for hours, just enough for you to get to your next charging station. 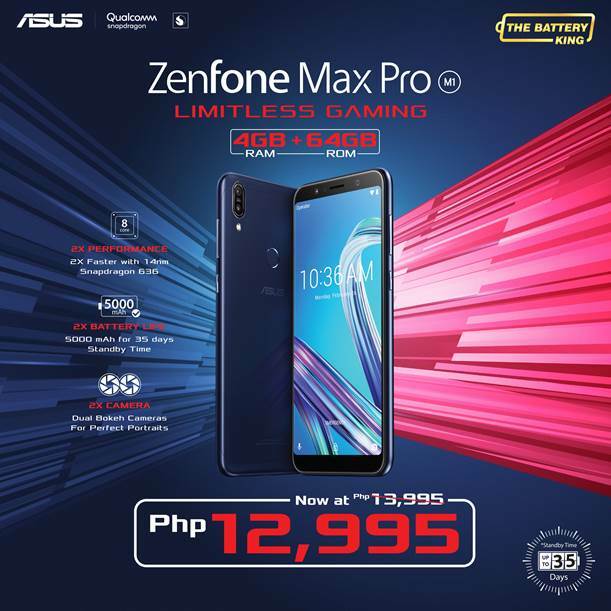 Recently, ASUS launched their ZenFoneMaxPro M1 4GB+64GB variant originally priced at P13,995 however starting today, the ZenfoneMaxPro M1 4GB+64GB variant will now be sold at a discounted price of P12,995 at ASUS Concept Stores, Kiosks and at ASUS PH E-Store. Wow this is good news! I have been waiting to get my hands on the Max Pro M1 for so long now!